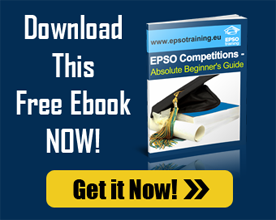 Want to enter the next EPSO competitions? Then we’ve got some exciting news for you! The European Personnel Selection Office (EPSO) has just announced that applications for the 2018 Graduate Administrators (EPSO/AD/356/18) competition will open this March 08. They will begin receiving applications on 08/03/2018. The deadline will be on 10/04/2018 at 12.00, Brussels Time. The total number of places they are seeking on the reserves list is 158. The first is where you confirm your eligibility and declare all your EU languages. Here, you will indicate your level of knowledge of any official EU languages, which you are an independent user at B2 level or above. The deadline will be the same with the deadline for registration as indicated. Once the deadline is up, you will receive a notice that indicates the 5 languages for the e-tray and the assessment centre. If what you declared as your languages is included in the 5 languages as language 2, then you will proceed with the second part of the application. This is where you choose your language 1 and 2, as well as complete your application form. Here, you will be asked to provide further information that is relevant to the competition (diploma, motivation, work experience etc.). The deadline will be stipulated on the invitation. Once you have completed the application process, you will then head on to this step where you have to sit through a series of computer-based multiple-choice question (MCQ) tests. Here, you will undergo multiple kinds of tests both in the languages you have chosen above. For your language 2, you will take the situational judgment tests. You must take note of the instructions given to you. Unless instructed otherwise, you must book an appointment for the MCQ tests. There will be dates offered that indicate when you can sit the tests and where. The booking and testing periods are limited. Right after you passed all the computer-based MCQ tests and considering that you have one of the highest total combined marks for the verbal and abstract reasoning tests, you will proceed with the E-Tray. This will be held in your chosen language 2 in one of the accredited centres by EPSO. Each of these will be marked out of 10. Again, you will have to score one of the highest total combined marks to qualify for the next stage. The marks scored in these tests will be combined with those from your e-tray exercise, amounting an overall score out of 80. The final step for the selection process is the reserve list. After going through all of the candidates’ eligibility according to their supporting documents, the Selection Board will draw up a reserve list (158 successful candidates) of those eligible candidates who have obtained all pass marks as well as the highest overall marks following the assessment centre. Before diving into deep waters, you must remember to read through the notice of competition for more complete details about the event. Familiarize yourself with all the necessary information—from what to expect down to the things you should prepare. And finally, take note of the important dates and keep yourself posted on any updates. Until then, we wish you all the best! The first upcoming EPSO exam is for Linguistic Assistants – EPSO/AST/137/16. You can apply for it from the 28th of April to the 31st of May 2016.